Spell Bound is an absolutely, positively, amazing conclusion to the Hex Hall series by Rachel Hawkins. If you haven’t read this series yet, you definitely must! Spell Bound picks up right where Demonglass leaves off. Sophie’s powers have been stripped away by the Council, and she doesn’t know the fate of her father, Archer, Cal or Jenna after the tragic events that happened at Thorne Hall. After being sent to find the Brannicks, a group of prodigium hunting women, Sophie discovers that a massive war is on the horizon. And it’s up to Sophie to stop it. Sophie Mercer is definitely one of my most favorite characters. She reminds me of myself, in the way that when she gets nervous, she tends to be snarky and sarcastic. I am totally the same way. I love watching her grow over the series; she has definitely become an amazingly strong character. I just adore her, especially her sarcasm. I love Sophie’s relationships with all the special people in her life; Archer, Jenna, Cal, her parents. With Archer, I have always liked him, but was suspicious as well. That definitely changed this time around. Jenna is the most perfect friend, ever. Then there’s Cal, who became part of a love triangle early in the series. I definitely have a huge soft spot in my heart for him. We also get to see quite a bit of Elodie this time around, and I definitely like her more now than I did when we first met her in Hex Hall! I want to also mention, that this book has so many hilarious moments in it. I laughed so many times, my kids kept asking what was so funny. I loved it! Overall, I LOVE THIS SERIES! It’s so good. If you haven’t read it yet, I definitely recommend that you do. Spell Bound is a wonderful conclusion to an amazing series. I need to read Demonglass asap!! I loved Hex Hall. I've read about 50-60 pages in this one so far. I should have finished it already, but I'm honestly kind of afraid of it being over. I'm Team Cal and I'm just totally afraid :( I'm happy it's a great book! I know I will finish it asap! I've only read the first book in the series. I need to continue it soon! i bought the first book in this series a few months ago and am excited to dive in! Oh this makes me so happy to hear that the final book is so awesome! I can't wait to read it mysel, I so very much enjoyed the first two books and I always love a snarky heroine! Gosh I need to cath up on this series! I've only read the first one :( I'm glad you thought they were all good though! 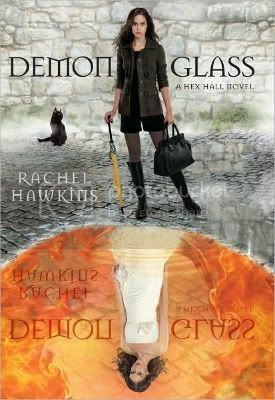 Yes, the Hex Hall series is definitely hilarious and soo good:)The end left me a bit melancholic..Great review! I haven't read any books in this series yet. It sounds like I am going to have to start them soon. I like how you describe the characters. It makes them see very well written and likeable. A wonderful review that has made me want to read this series! I got this one the other day! I'm almost scared to start it because I know it will be SO fantastic! I love Archer but, like you, I am a little suspicious of him! Great review, Christy!